Background: This study was a prospective observational study to assess the cardiovascular response and effects of mental stress during spine surgery depending on the surgeon's (attending or lead surgeon) versus assistant's (resident) position. Methods: Stress-related cardiovascular parameters were measured during 101 spine surgical procedures of a 40-year-old fellowship-trained spine surgeon with 12 years of practice. A training computer, personal scale, and thermometer were used to record the duration of surgery, heart rate, weight loss, and calorie burn. Results: The average maximum heart rate as an attending surgeon (124 bpm) was significantly higher when compared to the resident's heart rate (99 bpm) (P < 0.05). A higher stress level resulted in an increasingly higher average maximum heart rate according to the complexity of surgery: “easy” (103 bpm, 1 h: 51 min), “moderate” (125 bpm, 2 h: 57 min), and “difficult” (131bpm, 3 h: 56 min). The mean loss of body fluids at an average room temperature of 20.4°C after surgery was −0.82 kg (0 to −2.3 kg). The mean loss of body weight was calculated with −1.12% at the attending versus −0.59% at the resident (P < 0.05). Conclusions: The observed cardiovascular stress levels were similar to those of a moderate-to-intense workout such as cycling. Long-lasting surgeries result in a weight loss equivalent to a mild dehydration ranging from −2% to −5% of body fluids. Increasing dehydration will eventually worsen someone's cognitive-, visual-, and motor skills. Results of this study suggest that the early rehydration and other strategies (two surgeons and staged procedures) are helpful to minimize risks associated with prolonged, complex spine surgeries. Complex operations can last longer than 10 h. Breaks during an operation are seldom taken or considered completely impracticable. It is usual for the surgeon to stand at the operating table for the entire length of the procedure. This results in a very demanding physical situation. The field of work of a spinal surgeon includes a diverse repertoire of operations. In addition to minimally invasive procedures with an operating microscope, where a great deal of sensitivity is required during the work on very small anatomical structures, there are also interventions whereby coarse motor skills, craftsmanship, and strength come to the fore. In particular, working in ergonomically challenging positions of the upper body, neck, or head can represent an additional source of fatigue. Procedures requiring high levels of concentration over many hours bring with them problems of mental fatigue. The correction of severe spinal deformities or spinal tumors can demand operating for an entire day. Such procedures come with a high perioperative risk of complications such as paralysis or bleeding from an injured blood vessel, which increases the pressure on the surgeon with the incumbent responsibility to the patient and their relatives. There are few studies in the current literature investigating the cardiovascular parameters or dehydration in surgeons during operations or analyzing the consequences of physical or mental stress while operating.,,,, Compared to the medical profession, aviation and other professions involving high levels of responsibility, and for whom human errors, tiredness, and failures of concentration have potentially fatal consequences, have been better researched. Through research in the aviation industry, typical sources of error have been identified and their occurrence minimized by, for example, training in communication and coordination between the captain and crew (resource management). The professional aviation industry stands thus as the safest travel and transport modus. From a million flights can we expect < 0.15 fatal accidents, which speaks for a well-developed risk management system and an understanding of the pressures on the pilot and crew. In contrast, the 2014 Hospital report from allgemeine ortskrankenkasse AOK-healthinsurance (www.aok-bv.de) estimates 19,000 persons die in Germany from medical error, yearly. This suggests an urgent need to reduce errors and complications by improving the workplace and risk awareness during surgical procedures. This project aims to improve our understanding of occupational health risks surgeons may be exposed to during spinal surgery. The study comprises an analysis of relevant cardiovascular parameters from a healthy 40-year-old spinal surgeon (body mass index 25) with 12 years’ operating experience, during 101 operations of varying difficulty between December 2011 and March 2013 at the Orthopaedic Department of the University Hospital Innsbruck, Austria. The operations were either denoted “active,” when the surgeon was in the leading roll, or “passive” when he was assisting. The body weight was measured in a standardized way with an adult electronic scale immediately before and after the operation (Fa. Korona, Model “Dolores”). The measurement was made with an empty bladder before donning the operating gown. During the operations, there were no planned drink or toilet breaks. The measurement after the operation was made after removal of the operating gown. The heart rate and calorie burn were measured with a digital training computer (Polar® RS300X[Polar RS 300X technical specifications and accuracy: Watch accuracy better than ± 0.5 seconds/day at 25°C/77 °F temperature, accuracy of heart rate measurement: ± 1% or ± 1 bpm, whichever larger, definition applies to steady state conditions, calorie burn calculation by the patented technology OwnCal® personal calorie calculation algorithm]) and commenced with entering the washroom and ended on exiting the operating room. To assess the influence of ambient temperature, the room temperature was recorded at the beginning and end of the operation using an electronic thermometer. The data collection was transferred from a data collection sheet into an Excel Worksheet and evaluated using SPSS (IBM Corp. Armonk, NY, USA, Version 23). IRB approval for this study was not necessary because all parameters and perioperative measurements were noninvasive and obtained from a single volunteer individual ( first author) only. The difficulty rating of the operation was assessed on a scale from 1 to 3, where 1 designated “easy” (technically easy, often performed, routine procedure such as microscope-assisted discectomy) and 3 denoted “difficult” (technically difficult, seldom performed, high risk, e.g., correction osteotomies or multi-level instrumentations). For each operation performed, a data collection form was completed including the afore mentioned parameters, whether a lead gown was worn, the function of the surgeon, the type and length of operation and later, whether there had been any complications. For data collection the online program from the manufacturer Polar was used (Flowlink® - www.polarpersonaltrainer.com). All data sheets were collected in the study book and accordingly archived. The statistical analysis included data from 101 operations and assessed the physical and mental aspects of intraoperative stressors. The heart rate changes in the role of “active” surgeon and “passive” assistant were compared (n = 97, heart rate data unavailable for 4). The base heart rate at rest was 60 ± 2 bpm (beats per minute). In the role of assistant, the heart rate was on average 77 ± 6 bpm (bpm) as opposed to 98 ± 10 bpm in the “active” role. The difference was statistically significant (P ≤ 0.05, Mann–Whitney U-test). The comparison of average maximal heart rate was also significantly higher for the “active” role 124 ± 15 bpm compared with 99 ± 11 bpm for the “passive” (P ≤ 0.05, Mann–Whitney U-test) [Table 1]. Weight loss through loss of body water was assessed through measurement of bodyweight before and after the operations. The water loss ranged from 0 to 2.3 kg from 99 completed measurements. This comprises 0%–2.68% of the body weight of the surgeon. The average water loss was 0.82 ± 0.61 kg (0.97% bodyweight ± 0.71%). There was a high correlation (r = 0.64) between length of the operation and weight loss. The average weight loss per hour was significantly greater for the “active” surgeon 1.12% (±0.71%) compared with the assistant 0.59% (±0.52%) (P ≤ 0.05, Mann–Whitney U-test). The room temperature was recorded during 94 operations. Despite air conditioning, the temperature fluctuated between 19°C and 24.5°C. The average temperature at the start of the operation was 20.4°C and at the end 21.9°C. Results and key facts on physical stress during spine surgery are summarized in [Figure 1]. The mental strain associated with the degree of difficulty of the operation was assessed in 3 categories: easy, average, and hard. Easy operations include routine procedures without instrumentation (e.g., microscopic-assisted discectomy and dorsal decompression). In the intermediate group, there were relatively short, instrumented, routine procedures such as posterior instrumented spondylodeses or transforaminal intercorporal lumbar fusion procedures. The hard group includes technically challenging procedures such as revision procedures, long constructs for deformity correction, such as pedicle subtraction osteotomy, or combined anterior-posterior operations, for example, vertebral body replacement, and other complex procedures usually associated with high risks of intraoperative complications. The heart rate was chosen as the representative parameter for mental stress. Out of 101 operations, 48 were denoted as easy, 20 average, and 33 as hard. The length of the operation correlated (r = 0.53) with the subjective difficulty rating. Easy operations lasted on average 1:51 h, average 2:57 h, and hard 3:56 h.
The average heart rate was significantly higher for the “hard” operations compared to the “easy” (P ≤ 0.05, Kruskal–Wallis test). The difference in average heart rates between the “average” and “hard” groups was not significant (P<0.05). The results were similar for maximal heart rate, which was significantly higher during the more difficult operations (P ≤ 0.05, Kruskal–Wallis test). Again, there was no significant difference in maximal heart rates between “average” and “hard” operations (P > 0.05). The maximal recorded heart rate ranged from 173 bpm to 85 bpm [Table 2]. As a reference for the stress occurring while operating, the same measurements were repeated during sporting activities at various levels of demand: walking on even ground for 30 min (light activity), bicycle riding on an exercise bike at 21 km/h for 45 min (moderate activity), and circuit training for 90 min (strenuous activity). The average heart rates for walking, cycling, and circuit training were 104, 126, and 136 bpm, respectively. The maximal heart rates for walking, cycling, and circuit training were 118, 136, and 178 bpm. The results and key facts on mental stress during spine surgery are summarized in [Figure 2]. Standing for long periods, the technical application of surgical instrumentations and complicated spine surgical procedures demand an intense concentration and place a physical burden on the surgeon. It has been well documented that increased stress can lead to reduced levels of performance. In the worst case, it can lead to a mistake, and detrimental effects on the outcome of the operation, or even on the life of the patient. Increased stress also increases the risk of cardiovascular illness. On the basis of the systematic analysis of the cardiovascular parameters during 101 spinal operations, we have demonstrated the physical and mental exertion to be significantly greater for surgeons in the leading (active) role compared to assisting (passive). The effects were demonstrated across a range of operating room temperatures, operating times, and operating difficulty. That surgical experience itself does not always lead to reduced stress levels was demonstrated by Kuhn et al., in a similar study during coronary artery bypass operations. They came to the conclusion that introducing a less experienced assistant in coronary artery bypass procedures could result in a measurably increased mental stress even for the experienced lead surgeons. In comparison with other physical activities, the exertion levels as measured by the average heart rates during spinal surgery regardless of difficulty equate with walking on even ground at a pace of about 6 km/h. The subject recorded an average heart rate while walking of 104 bpm and while operating an average of 92 bpm or less. In contrast, the maximal heart rates for the most difficult operations showed spikes of over 173 bpm, which one might record under strenuous physical activity, such as circuit training (CrossFit®). The results are similar to those of Bergovec and Orlic who studied the physical stress during total hip replacement surgery on an orthopedic surgeon. They demonstrated that the reaction of the cardiovascular system was not more than during moderate physical activity. However, in two operations maximal heart rates of over 170 bpm were achieved which would encompass the strenuous activity of circuit training. For example, which factors could be influenced to reduce the stress on the surgeon? Klein et al. in 2010 demonstrated that a modern operating room could reduce physical strain in a study measuring the heart rates of 10 surgeons during laparoscopic procedures in modern and older operating rooms. The modern operating rooms were constructed to the latest ergonomic and technical standards. Furthermore, learning and practicing coping strategies can lead to a better tolerance of stress or exertion. Coping strategies include mental, and also breathing exercises which help maintain calmness and concentration during difficult situations. During spinal surgical procedures, drinks breaks or recesses are not usually planned or possible while the pace of the procedure and pressure to minimize the operating time takes precedence. Similar to most orthopedic procedures, spine surgery requires intraoperative X-ray and the use of heavy protective lead gowns. Lead gowns are nonbreathable and increase the body temperature during physically demanding work, that is, they provide an additional thermal stress with increased perspiration and dehydration. From our daily practice and certain studies, we know that surgeons and assistants have little capacity to compensate for this water loss. Many studies have demonstrated that dehydration impairs cognitive functions such as short-term memory and visual-motor performance.,,, Adan defines mild dehydration as loss of 1%–2% body water and moderate dehydration as loss of 2%–5% body water. The critical cutoff at a loss of 2% body water was suggested in this study. Gopinathan et al. demonstrated a loss of performance in physical exercises under thermal stress which correlated with the degree of dehydration and was statistically significant from >2% loss of body water. The question of how great the fluid loss during an operation is and when it starts to affect the concentration and physical performance of the surgeon could not to be definitively answered in this study. There are too many other situative and individual variables which come in to play. After 4 h and 40 min operating time for a spinal surgeon, a maximum loss of 2.68% body weight, representing 2.3 kg body water, occurred. In 8 from 101 operations, >2% of the surgeon's body weight was lost through dehydration. In a further 38 operations, water loss was between 1% and 2% body weight which is keeping with mild dehydration. With reference to the current literature,,,, we must assume that in these 8 occurrences of moderate dehydration that the surgeon by the end of the operation had to deal with reduced physical and mental performance. We see evidence of this after long, difficult operations, with the consequent loss of body water, when we have headaches, thirst, and the feeling of physical or mental exhaustion. The authors consider that for longer, more difficult operations, the inclusion of planned breaks for taking on fluids could improve or maintain the performance of the surgeon. Not every operation runs to plan. Unforeseen complications can lead to additional cognitive stress. This is difficult to measure. We divided the subjective stress level, according to the difficulty of the procedure undertaken, into three categories and compared the heart rates. As a rule, the length of the operation corresponds with the level of difficulty. Operations designated as easy took on average 111 min, average 177 min, and difficult 236 min. For the statistical analysis, the average and difficult levels were compared to the easy. The maximum and average heart rates were significantly higher in the difficult group [P < 0.05, [Table 2]. The subjectively more difficult operations showed a corresponding increase in cognitive stress as indicated by the increased heart rates. The cardiovascular parameters measured in this study came from a single surgeon and may not be representative of all surgeons. The operating surgeon was male, healthy, middle-aged and had 12 years’ operating experience at the time of the study. However, we would expect similar results from the most orthopedic or trauma surgeons of a similar age and physical constitution. The effects of stress are highly variable, depending on personal experience, both the extent of surgical experience as well as the individual character of the surgeon. This makes it difficult to draw overarching conclusions with broad application. However, we were able to show both physical and psychological factors which may impact the performance of spinal surgery using relatively simple cardiovascular measurements. We have had six complications (incidental durotomy [n = 3], one atypical [combined] course of the L5/S1 nerve root that prevented transforaminal lumbar interbody fusion cage placement, a pedicle fracture, and one vena cava mass bleeding during an anterior lumbar interbody fusion procedure). For complications other than durotomies, we have noticed a longer than usual odds ratio time and higher maximum heart rates. The data from 101 operations, recorded over a year's time, represents a typical occupational exposure through a wide variety of spinal procedures for a spinal surgeon. Future studies could expand the number of surgeons with differing ages and experience levels and include a large number of procedures, to draw solid conclusions and establish best practice to minimize errors, and optimize the performance of surgeons in the operative environment. Furthermore, more detailed parameters of the cardiovascular system and indicators of metabolism or exertion could be measured, such as electrocardiogram, lactate, cortisol, breathing rate, and oxygen utilization. The difficulty grade of the operations is somewhat subjective, lacking formal definitions and varies from surgeon to surgeon, making a standardized comparison problematic. Better defining which operations are deemed difficult or are linked to cognitive or physical stress would help to objectify the conclusions of further studies in this field. Cardiovascular parameters and responses depended on intraoperative stress levels and length of surgery. Average and maximum heart rates were significantly higher when in the role of the lead surgeon (Attending) compared with assisting (Resident). Long spine surgical interventions result in a weight loss equivalent to a mild dehydration (−2% to −5% of body weight). Dehydration will worsen cognitive, visual, and motor skills. Results of this study and a review of literature suggest that scheduled breaks for rehydration, staged surgical interventions, or utilization of two surgeons for prolonged, complex spine surgeries can minimize risks associated with increased physical and mental stress, for example, help to improve surgical performance and better outcomes. Spinal surgical procedures are more stressful for the surgeon than the assistant surgeon. Complex operations have longer operating times and comprise a greater physical and cognitive stress for the surgeon. Excessive loss of body water during long operations should be avoided. Enerson DM, Eisenfeld LI, Kajikuri H. Heat and moisture trapping beneath surgical face masks: A consideration of factors affecting the surgeon's discomfort and performance. Surgery 1967;62:1007-16. Li Y, Tokura H, Guo YP, Wong AS, Wong T, Chung J, et al. Effects of wearing N95 and surgical facemasks on heart rate, thermal stress and subjective sensations. Int Arch Occup Environ Health 2005;78:501-9. Nielsen R, Gwosdow AR, Berglund LG, DuBois AB. The effect of temperature and humidity levels in a protective mask on user acceptability during exercise. Am Ind Hyg Assoc J 1987;48:639-45. Demirtas Y, Tulmac M, Yavuzer R, Yalcin R, Ayhan S, Latifoglu O, et al. Plastic surgeon's life: Marvelous for mind, exhausting for body. Plast Reconstr Surg 2004;114:923-31. Böhm B, Rötting N, Schwenk W, Grebe S, Mansmann U. A prospective randomized trial on heart rate variability of the surgical team during laparoscopic and conventional sigmoid resection. Arch Surg 2001;136:305-10. Song MH, Tokuda Y, Nakayama T, Sato M, Hattori K. Intraoperative heart rate variability of a cardiac surgeon himself in coronary artery bypass grafting surgery. Interact Cardiovasc Thorac Surg 2009;8:639-41. Sharma MS, Thapa A, Chandra SP, Suri A, Singh M, Bahl VK, et al. Intraoperative pulse and blood pressure recordings of neurosurgeons: A pilot study of cardiovascular performance. Neurosurgery 2010;66:893-9. Kuhn EW, Choi YH, Schönherr M, Liakopoulos OJ, Rahmanian PB, Choi CY, et al. 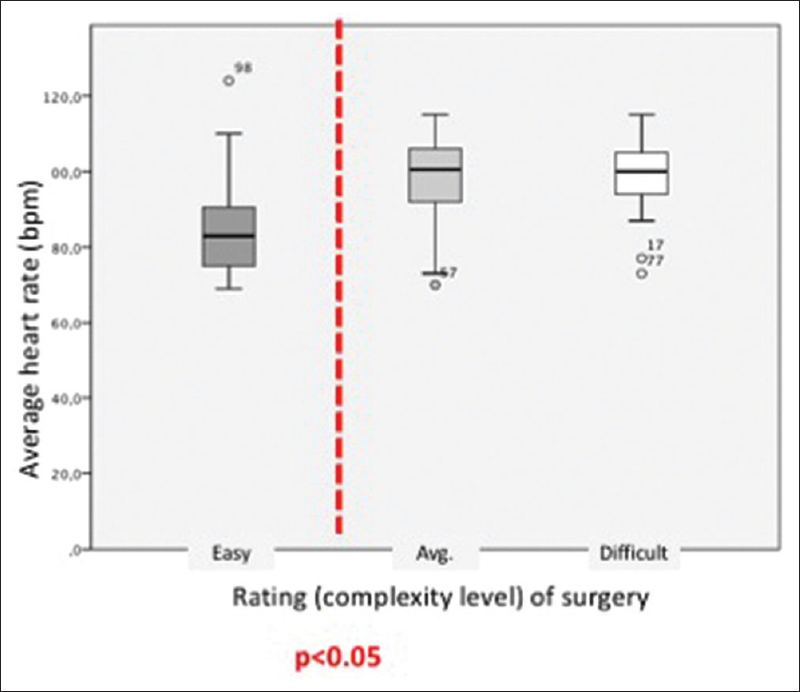 Intraoperative stress in cardiac surgery: Attendings versus residents. J Surg Res 2013;182:e43-9. Müller M. Risk management and safety strategies in aviation. A role model for Medicine? Z Allg Med 2003;79:339-44. Arora S, Sevdalis N, Nestel D, Woloshynowych M, Darzi A, Kneebone R, et al. The impact of stress on surgical performance: A systematic review of the literature. Surgery 2010;147:318-30, 330.e1-6. Sloan RP, Shapiro PA, Bagiella E, Boni SM, Paik M, Bigger JT Jr., et al. Effect of mental stress throughout the day on cardiac autonomic control. Biol Psychol 1994;37:89-99. Bergovec M, Orlic D. Orthopaedic surgeons’ cardiovascular response during total hip arthroplasty. Clin Orthop Relat Res 2008;466:411-6. Klein M, Andersen LP, Alamili M, Gögenur I, Rosenberg J. Psychological and physical stress in surgeons operating in a standard or modern operating room. Surg Laparosc Endosc Percutan Tech 2010;20:237-42. Wetzel CM, Kneebone RL, Woloshynowych M, Nestel D, Moorthy K, Kidd J, et al. The effects of stress on surgical performance. Am J Surg 2006;191:5-10. Adan A. Cognitive performance and dehydration. J Am Coll Nutr 2012;31:71-8. Gopinathan PM, Pichan G, Sharma VM. Role of dehydration in heat stress-induced variations in mental performance. Arch Environ Health 1988;43:15-7. Szinnai G, Schachinger H, Arnaud MJ, Linder L, Keller U. Effect of water deprivation on cognitive-motor performance in healthy men and women. Am J Physiol Regul Integr Comp Physiol 2005;289:R275-80. Tomporowski PD, Beasman K, Ganio MS, Cureton K. Effects of dehydration and fluid ingestion on cognition. Int J Sports Med 2007;28:891-6.